Summerlicious is back this year. This year I get to try out a few different restaurants and hoping they are going to be great. The first one is Cafe Moroc. I have no idea what to expect because I never tried Moroccan food before. Neither knowing where the country is on the world map lol. Base on this fact, I only wanted to try out their lunch just in case I don't like their food beside it is cheaper too. As usual, for a $15 lunch I got appetizer, menu, and dessert. My overall impression is, I will go back for dinner for their regular menu. 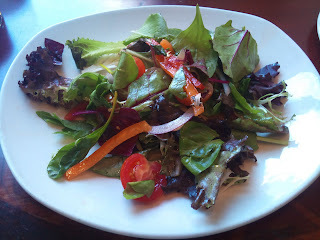 Veggies are fresh and the vinaigrette has a hint of sweetness. Love it! 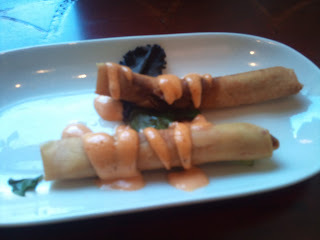 Taste a bit like curry beef spring roll. Not sure what the orange sauce is but it taste good. Very moist and tender salmon. 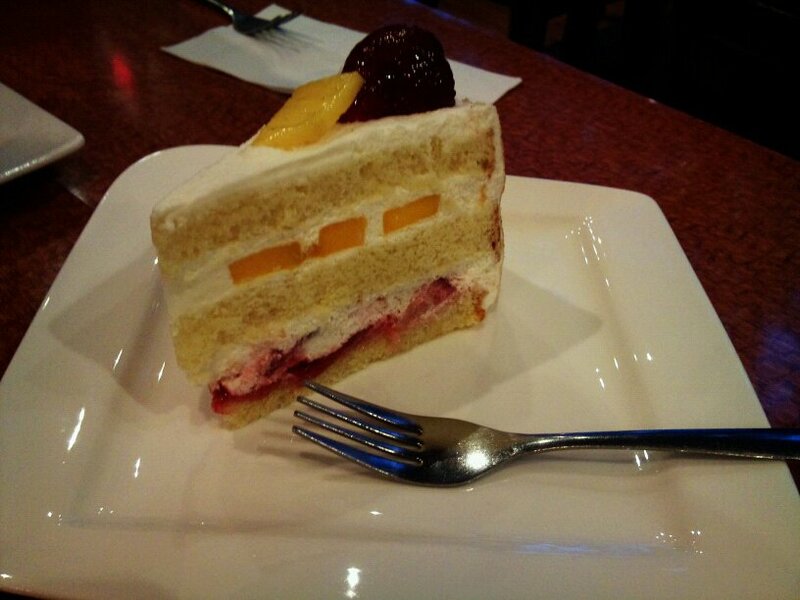 The sweetness of the mango makes it taste even better. Julienne of chicken breast wrapped tightly with honey-butter onion, Mediterranean olives, couscous and rich tagine sauce, served with choice of Moroc Frites or Café greens. I can't really tasted the chicken as it was over powered by the yummy couscous. 6-ounce AAA Angus New York Strip loin, seasoned and grilled, blanketed with caramelized onions and horseradish mayonnaise, served with choice of Moroc Frites or Café Greens. 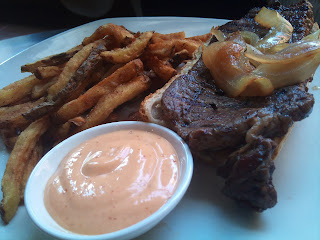 According to my friend, the steak was average and the french fries are soggy. 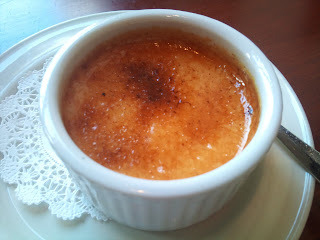 This is one of the best creme brulee I have ever tried. It was not too sweet so I could tasted the custard. C.C. and I check out daily deal all the time to look for good restaurant deal. Not only that it is a good way to try out different restaurants but also a great way to save money. I have heard of RAA advertising on 680 News when it first open. I always want to try it out. (That's the power of advertisement!). One day, I spotted a deal from RAA $20 for $40 of food on the internet. This is a perfect excuse to try out new food. There is no free parking on site, however there is a green P at the back of this restaurant. This restaurant is heavily decorated with wood. My first impression is "wow it is very dark but warm and cozy". C.C. and I were greeted by the owner right away and a table for 2 was waiting for us. Next, the waitress gave us 3 different menus (1) Regular Menu (2) Drink Menu (3) Food not available Menu ^o^. 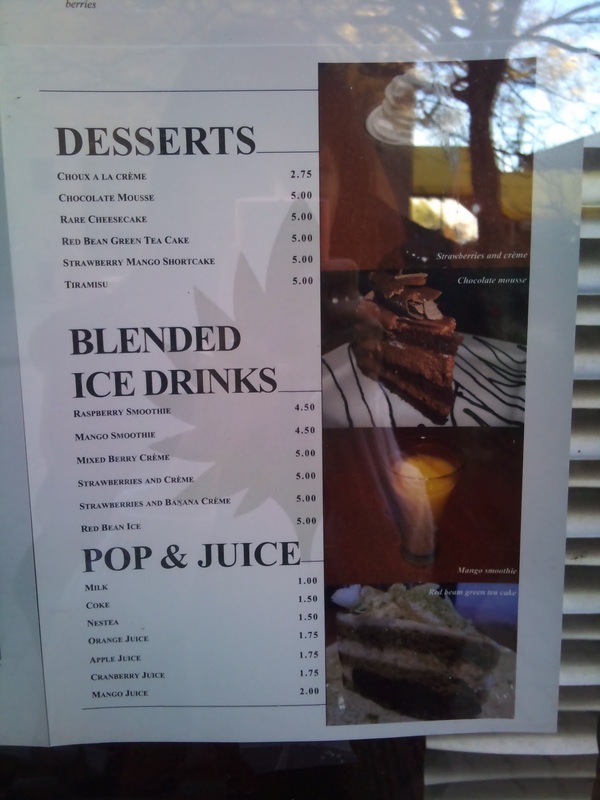 At first I was surprise to see the "Food not available menu". Later on I was a bit disappointed because I found out the food which I wanted to order were on the not available menu. Finally, C.C. and I ordered some fried tapas and sashimi to try out. 7 samurai is way too sour to drink on its own. It is not my taste. Tequi - RAA is much better because it is an orange juice based drink. Spicy grilled squid. C.C. said it is very spicy but I found it average. It has a strong taste so not good with sashimi together. Deep fried squid, ginger mayo. I couldn't taste the ginger in the mayo at all. Overall, this is a very delicious dish. The calamari was still crispy even when it is cold. Regular Fishy not a big surprise. Crispy rings with soy ginger flavor. Excellent crispy rings and very juicy. I can't believe I haven't update my blog for such a long period of time. I guess I was getting too lazy. 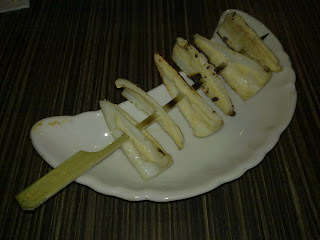 This time I am going to talk about a restaurant which I have visited before - Shiso Tree. 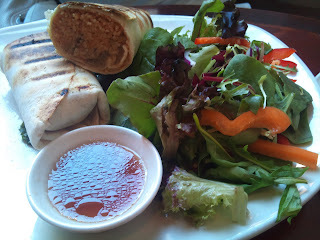 I have been visiting this restaurant regularly and their quality of food are getting better and better. When they first started there weren't lot of selections on the menu. However that has been changed. 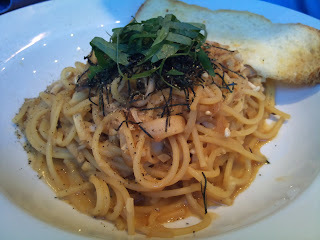 Their menu has 3 different sections: Wafu (Japanese style spaghetti), Cream and Tomato sauce based spaghetti. As many of you may have notice, Shiso Tree only serve spaghetti and you can't find any other pastas. This time C.C. 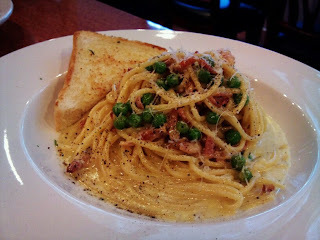 ordered Spaghettial nero di seppia on the menu of the month and I ordered Creamy Bacon Carbonara. We paid $7 extra to add the pasta set which includes soup of the day and a piece of cake. greens with tomato in a soy sauce and sesame based dressing. 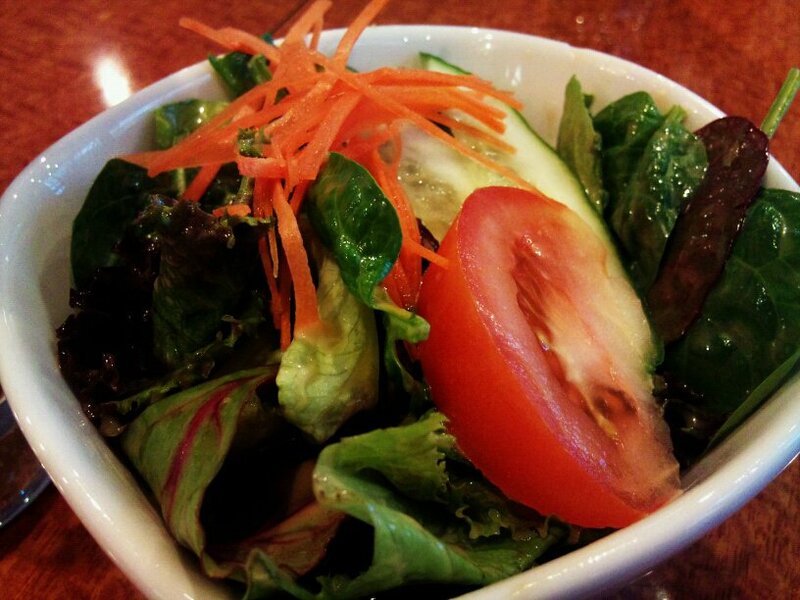 This is a very fresh and tasty salad. Soy sauce and sesame are a good combo. A very freshly blended mushroom soup without lot of cream. 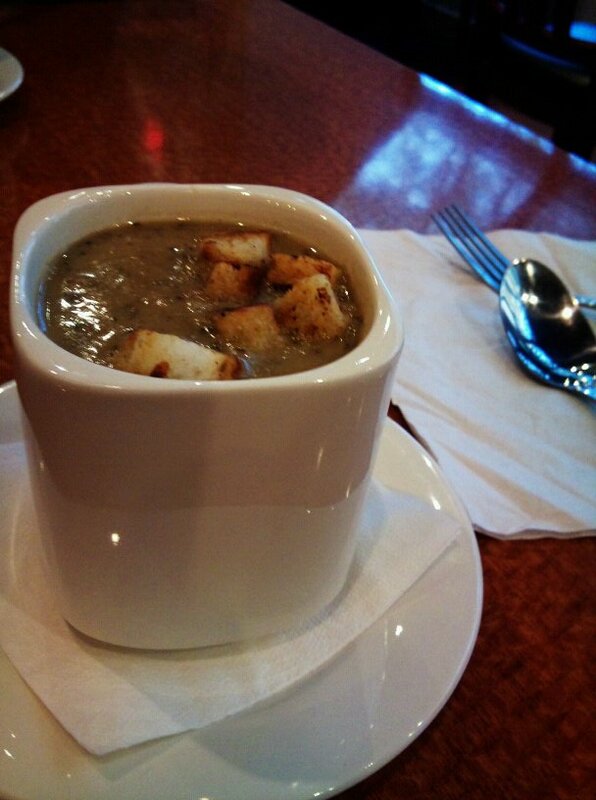 Shiso tree's soup is a must try. I tried their spinach soup before and as always freshly blended. This is a big hit. A very creamy dish yet I didn't have the gluey feeling in my month. I tasted the egg yolk, cheese, and bacon combined together well. Spaghetti in squid ink sauce with clam and calamari. 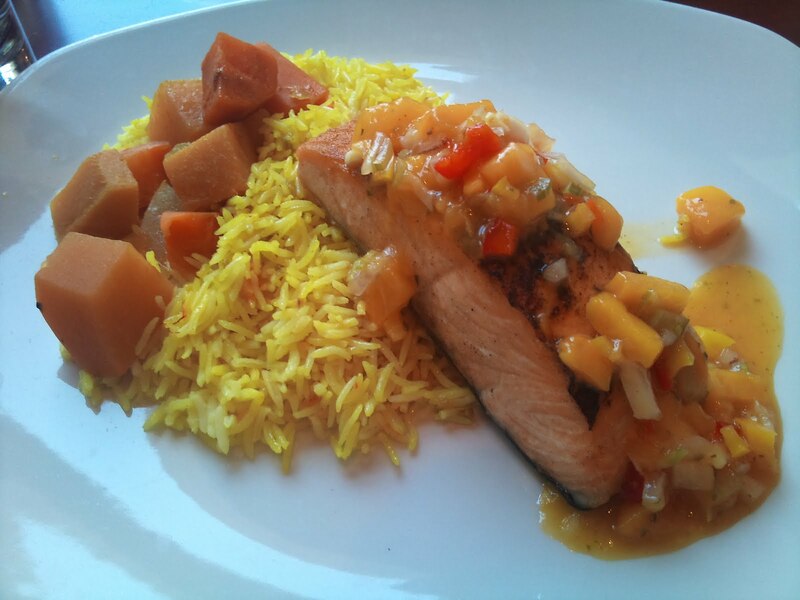 This is a special dish which is on the monthly menu. I wish they can include it in the regular menu. 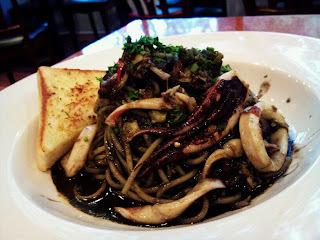 This is my first time trying the squid ink spaghetti. Tell you the truth I can't really tasted the "ink". The taste of the sea came from the clam and calamari which were cooked to perfection. light creamy mousse cake with a hint of lemon taste. 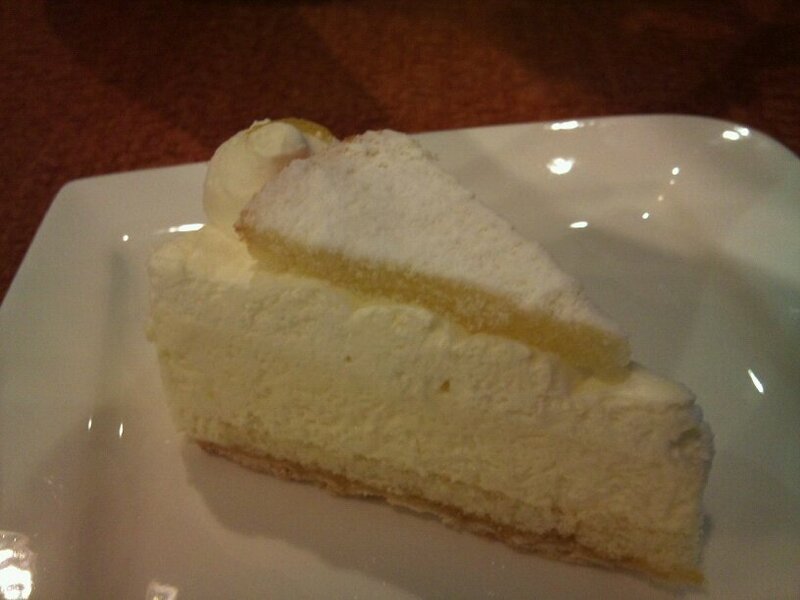 The fruits are fresh with the light cream. Not too sweet. Perfect for after dinner dessert. Alright, enough with the drama and let's go back to the food. Zelda's Restaurant has a very good selections of food on their dinner menu includes burgers, pastas and vegetarian dishes. I was very satisfy with the food and my friends dishes were all delicious. Another special thing about Zelda's Restaurant is the bill or receipt was bought to us in a high heel shoe lol. 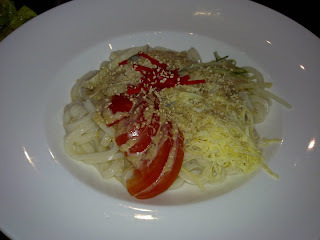 Shiso Tree Cafe is another new restaurant situated in J-town. C.C. heard from his colleagues that this restaurant served Japanese style pasta so we decide to give it a try. 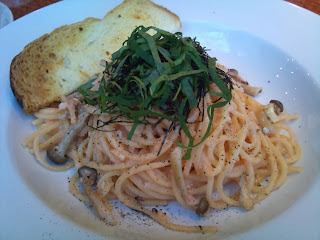 Their menu have 8 different selections of pasta and two of them are Japanese style. Here is a picture of what the restaurant looks like. 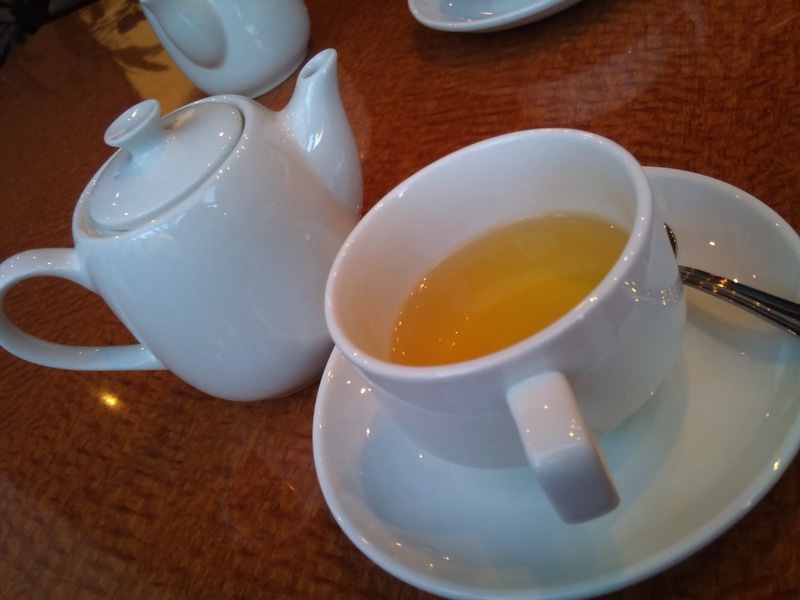 Shiso Tree Cafe has a selection of different organic tea. They are $3 each. I found it a bit pricey. This salad comes with the pasta we ordered. 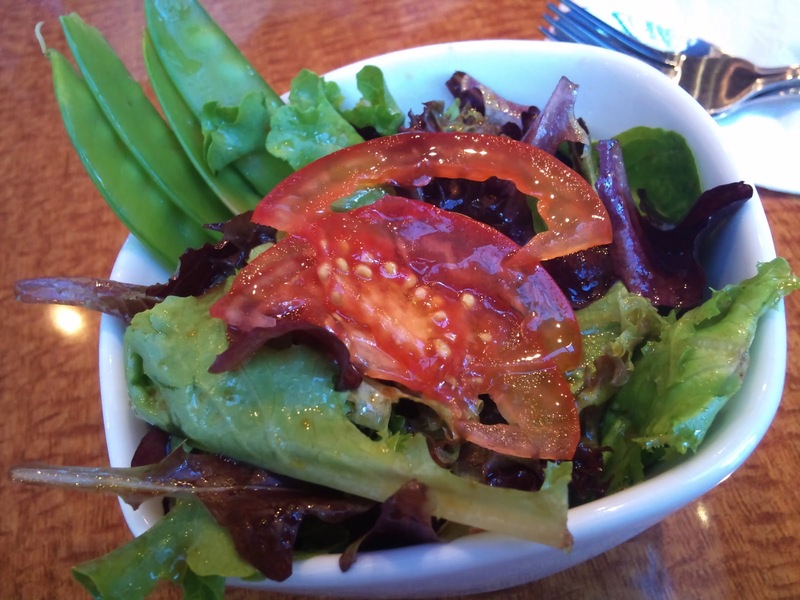 This is the first time I tried out a soy sauce based salad dressing. Very interesting and quite tasty. I can't really tasted the Pollock roe but over all it is a very tasty dish. Japanese shoyu (soy sauce) based spaghetti with enoki, shimeji, oyster and king oyster mushrooms. 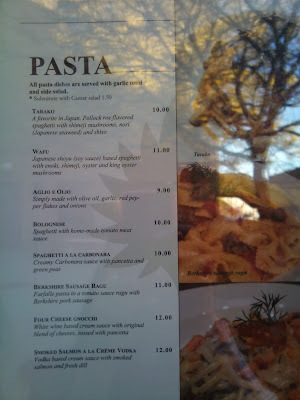 I don't find it to have a big different as compare with the Tarako pasta despite it is $1 more than the Tarako Pasta. 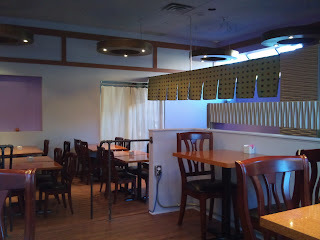 There are 3 new restaurants open this year in J-Town and Izakaya Ju is one of the them. 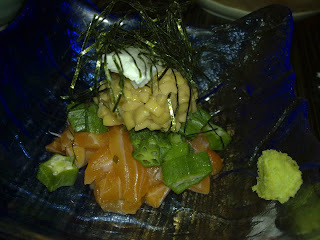 I've visit Izakaya Ju many times recently as their food are very Japanese and delicious. They got the liquor licence recently so there are selection of different Japanese beers and sakes. Izakaya Ju carries a lot of traditional dishes include: Yakitori, and Ochazuke. They use Binchōtan (a type of charcoal) to grill the yakitori so it has the right amount of distinct smokiness. I love this dark large. It is very easy-to-drink. However I don't think it is for sale in LCBO yet. Very tender beef tongue with spicy onion on top. It is a cold dish. This is on the special menu which changed regularly. The shrimps were very crispy and I can eat the "whole" shrimp along with the shell !!! Ton toro is pork cheek meat. It is very tender and flavorful. Minced beef and veg curry on rice with porched egg. This dish was covered with grounded beef cooked in curry. You don't see the curry sauce but it sure has a very strong taste. This is on the lunch menu but can be ordered during dinner as well. A very interesting dish. It is a mixture between the crunchy cartilage and the meat itself. Pork intestine and yamcake miso stew. It has a strong miso taste which makes everything richer. 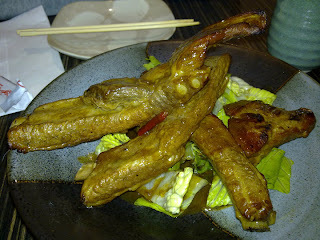 The pork intestine tasted excellent because it has absorbed all the miso flavour. Manila clams steamed in sake soup. The clams were very fresh but nothing mind blowing. Deep fried rice cake in bonito broth. The rice cake was deep fried so the surface absorb the flavour from the broth. The centre of the rice cake was very soft and sticky. Love it! 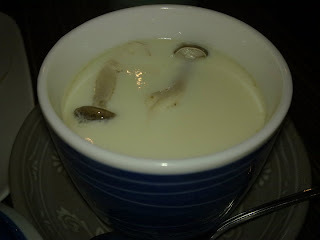 An egg custard dish with shrimp and shiitake mushroom served in a tea cup. The egg was very smooth and it was not over cooked. Very juicy BBQ Ribs. I love the sweet BBQ sauce. This can be found in the special menu. It is a very refreshing dish and I enjoy the nutty sesame taste a lot. Natto is a very Japanese food and not everyone will like it. I expected it to have a very strong Natto taste but surprisingly it tasted pretty good. Grill chicken soft bone or cartilage. It is slightly spiced with salt only. I love its crunchy texture.